We didn’t do a whole lot today. We met two of my sisters to take some group photos, and we went to lunch. I have been so good about writing a new post everyday, but it turns out that I’m not as good about checking to make sure that my post was actually published. I wrote Baseboards: Day 2 on November 25, but apparently I didn’t hit publish or the publishing was interrupted or whatever. The take-home is that my post wasn’t published, so after 27 days of posting everyday, I find out that I failed at NaBloPoMo two days ago. I am so disappointed. Especially because I actually wrote the freaking post! Plus, now I can’t win a prize for successfully posting every day in November! Our house is way cleaner today. They didn’t make nearly as much of a mess, and it looks like they tried to clean up a little bit after themselves. 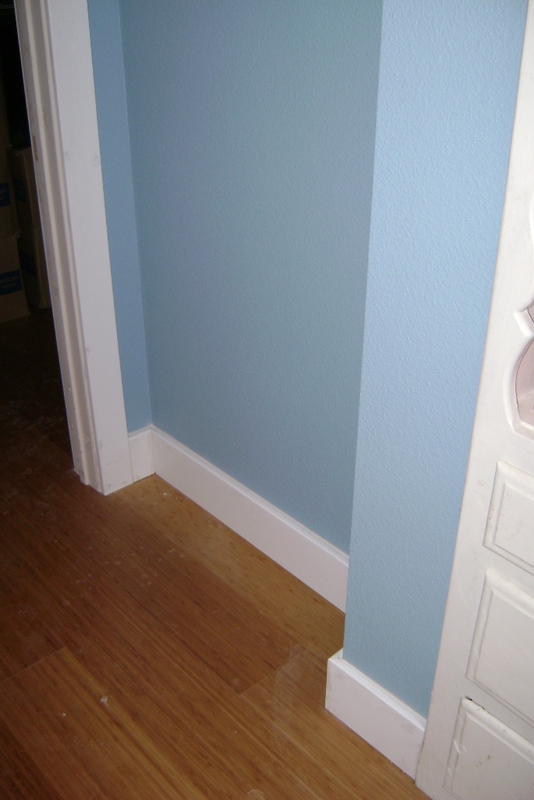 Almost all of the baseboards are done, with only the areas we wouldn’t let them do waiting for baseboards. They didn’t finish all the door casings though, so it’s not like they were waiting around with nothing to do. That means they should be finished today! The house looks great with the baseboards, and it’s strange how much of a difference they really make. Everything is starting to pull together and look finished, which is hard to wrap our heads around. When they finish today, we will be practically ready for the inspection. We’ll have to paint the fireplace and do some touch ups, but that’s about it. It is so crazy! Happy Thanksgiving, everyone. I ate way too much already, but I’m still looking forward to eating the chocolate cream pie I made. You know it’s serious if I bother to cook something. Oh man, our house is a mess. It hasn’t been this much of a mess since the drywall went up. About half the door casings are installed, along with the baseboards in the hallway. Luckily, they didn’t get more done than that, since we didn’t finish the floors this weekend. Unluckily, they had to rasp drywall and didn’t bother to cover any of our stuff. Everything is so dusty now, especially in the bedroom. That’s the worst part, that it’s primarily in our bedroom. They didn’t even bother to close our closet door. It also looks like they used the new comforter my mom just gave us as some sort of drop cloth. I had forgotten how much I hate having construction workers inside my house. They make a mess. They use all of our stuff. They don’t clean anything up. The move all of our stuff around, making us wonder where they found it. It’s so annoying. We didn’t finish the floors last night either, since I didn’t get home until almost 8pm. Muffin did a ton of work while I was gone, but there were two tons of work to do. Since they only got through half the door casings yesterday, I can’t imagine that they actually could finish today, so I’m not too worried about it. There will be some baseboards that they’ll need to install on Wednesday. Then, our baseboards will all be installed, and the construction workers can get the hell out of our house.